Whenever in Paris, we hardly ever take our breakfast at the hotel.. I much prefer exploring the local cafés, watch friends meet for a coffee before work, regulars catching up with the waiters on the latest news, and the quartier getting ready for the day. I love Paris' left bank, and most of the streets and places depicted on my 'Rendez-Vous Rive Gauche' scarf are familiar friends. 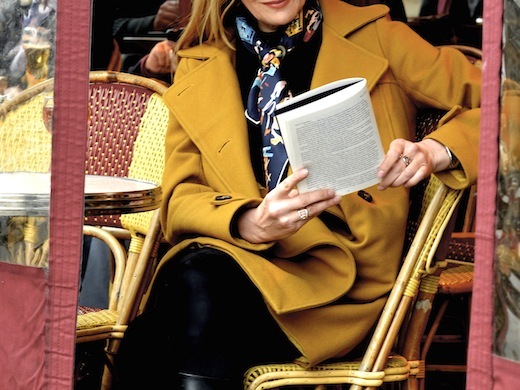 It was fun to wear the scarf while strolling through Saint-Germain, and to take some matching pictures along the way. The 'Comptoir des Saints-Pères' at the corner of the Rue Jacob does not only serve excellent breakfast, but it also has a rich history.. it used to be frequented by James Joyce and his family, Ernest Hemmingway and F. Scott Fitzgerald (the Comptoir was called Michaud back then). Serge Gainsbourg lived around the corner (in the Rue Verneuil), and Jane Birkin a few houses further down the Rue Jacob (until 2000). the table next to us at the Au Sauvignon ~ a small afternoon feast of foie gras accompanied by Poilâne bread..
Dear MaiTai, as always, a pleasure to see Paris through your eyes! :-) And you have a talent for seeing the harmony of the natural and manmade environment, with your ensembles! Love the boots...the whole ensemble is so chic. Many thanks for the lovely comment! *sigh* love Paris, love your ensembles and love your food photos! Do you have a favourite hotel that you stay in Paris? Ah the beautiful Paris that I love with a tranche de foie gras pain Poliane et un bon verre de vin rouge ! According to the beautiful and gracious lady who had the dish, it was very good too! Bonne fin du semaine. I have not been to Paris in ages and as it is my home town, looking at your pictures, I am missing it a bit... (I usually don't! )Le Comptoir des Saints Pères, I think I know exactly where it is and have had a couple of coffees there as a student... Gasp! Next time you are in the area, perhaps consider paying the ever beautiful Sabbia Rosa" boutique for fantabulous silken undies and goodies! (I am not on their payroll!). And as far as the pain Poilane goes, the best Croque-Madame I ever had was in another coffee shop as a student in that very area and it wasn't actually a sandwich but a slice of toasted Poilane with the regular trimmings on it: yum. And as for Mr Hemingway, I have visited his house on Key West about a month ago... It was warm, then... Gasp again! Great minds think alike! You seem to have a great time in Paris and by the look of the pictures, you are as elegant as ever! A warm welcome to you, dear S! How nice to know how you found my blog. I am relatively new to Pinterest, but am enjoying it greatly. Your Easter weekend sounds wonderful, like a scene straight out of Dr Zhivago! Your comment reminds me that it has been far too long since I've visited Giverny, it is such an enchanting place. Ok last comments got lost on the mac! I waxed lyrical about your talents as a blogger and memoirist. Your blogs are such a visual and inspirational delight. You are truly talented and bring much joy to others. Keep up the good work! I am hoping to enjoy your blogs around a campfire occasionally in remote Western Australia over the next month. 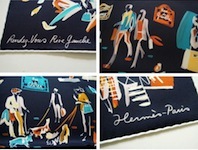 Taking my one and only vintage Hermes scarf to brighten up my camping attire (on special occasions). Always looking forward to more. Oh it is so very frustrating when comments get lost! Thank you for trying again, and for the lovely warm words. Your description of wearing vintage Hermès by a camp fire in remote Western Australia sounds like a scene from Out of Africa (today's comments trigger memories of favorite movies! ), and makes me want to pack my bags :-) Have a most wonderful time away! Must say a word more here...so much love this post for its beauty and for the comments too. The scene with the one and only vintage Hermes scarves which will be used and protected for a month by a camfire - it sounds like description of the word "love" to me, so special and it really reminded me of my very first scarf, how I treasured it and how scared I was when wearing it around. My heart was beating "OK, it is the first and the last one", however I continued afterwards, also bought the scarf rings which made my wearing space much wider and I got new dimension of freedom when wearing scarves. However, I still remember my first cautious steps with my scarf and now, thinking back, I am sorry I did not take it to my long walks in nature to be with me during silence and relaxing moments. Wish you a nice time with your scarf! So special! J adore votre foulard tellement parisien! Ich bin so begeistert von Ihren wunderbaren Fotos, Erläuterungen und Tipps. Die hübschen Accessoires und Anregungen. Man möchte eintauchen und noch viel mehr sehen. Loslaufen kaufen und ausprobieren oder einfach nur schauen und warten - what comes next. Thanks for all the lovely pictures of Paris recently. Your reply to Beatrice above made me happy! - I was unaware there was Poilane in England- I always assumed it was only in Paris- I can't wait till my next stay in London in two weeks- I know where I'm going to visit!! Also for the tip about Au Sauvignon- Le Bon Marche, and the Hermes Rue de Sevres store are probably my two favourite shops ever- so a perfect match! Of course I love the pics of you, wearing your lovely RvRG scarf...how much fun to be at the very placed that breathed inspiration into the design! But...I'm still staring at the pain du Poilâne (this bread is proof that God exists!) My friend took me to Pied du Cochon, and the waiter placed some very respectable bread at our table. When I asked if we could please have Poilâne instead, he treated me as though I were the most brilliant American he'd ever encountered!! Have a wonderful weekend too, and hope your RdV RG will be with you soon! 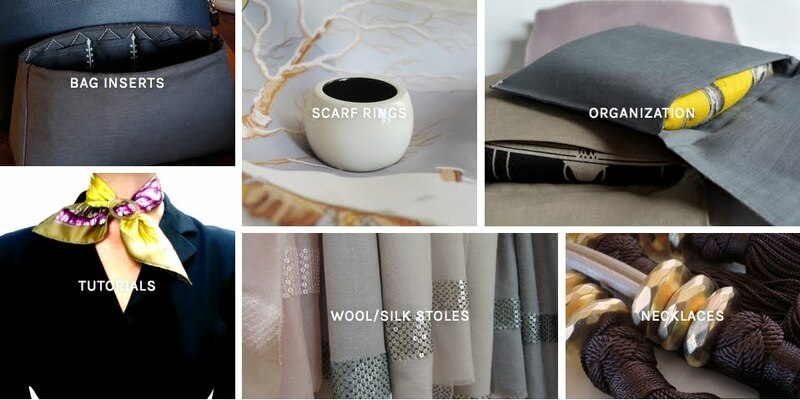 Lovely post, I love how the RG scarf comes alive (and with so much significance for you). A few years ago, a friend of mine rented a flat by the boulangerie Poilâne in the 6th, it was like living above H, endless temptation. Apparently pain Poilâne was even brought to the United States by the Air France Concorde when it was still flying (I don't know if it is an urban legend, but it must have been some expensive bread!). I absolutely love all the aesthetics in this post...the colors of the scarf and your clothes blending with the colors of Paris. Just beautiful. Many thanks, vintagefrenchchic! So lovely to hear you enjoyed the post. How nice it is to have a scarf which lives through real life! My visit to Paris was too short to capture all details shown on the scarf. However, very nice to read the above comments, memories and nice thoughts related to Paris. May I ask - do you go into shop and go "through thinking phase" or you immediately know that you need "just that" scarf when you see it (i.e. do you know which one is the right one when you see it, without much choosing)? 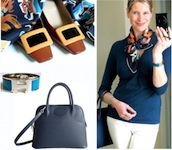 I often stay in boutique for a longer period of time (well, 30 minutes or even longer) and go empty handed. Then, after returning home, two or three days later, I realize that it was a big failure and I must travel back to get that scarf, which is in that moment "a kind of destiny", "to be or not to be", "fatal" and so... Not often, but it has happened several times. Do you want to return some scarves after buying them (it has happened to me too, but never did it - too complicated). Dear Lea, I love your questions, please don’t ever feel like not asking! 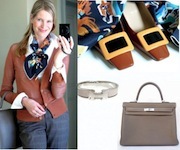 Re outfits: If you look through the capsule wardrobe series, you see pretty much how I dress whatever I do ~ picking up DS from school, running errands, going to the supermarket or shopping in town, seeing friends etc... and, going to Hermès! Thanks for your answer a lot. Regarding the above two "scarf selection guiding posts" - oh, of course I have gone through them 100+ times and they have helped me tremendously (to keep away from the colours which are not "mine", to choose the scarf which will tie nicely, etc...). Good to know 30 minutes is not excessive and also somehow relaxed that I could also go to Hermes in my usual outfit, as I somehow feel uncomfortable to "dress specially for H" in a way which is "not me" and which should reflect some picture which is "out of my usual frame", so to say. I love the wonderful combination of that warm, bright mustard coat with your dark neutrals, linked by the mustard in the scarf. A very chic ensemble.